Do you remember that book Dear God, It’s Me Margaret? Written by the incomparable Judy Blume, it was revolutionary at the time as it addressed all of the angst that comes with being an adolescent girl. From training bras to feeling like you were the last one to get the big ‘P’ to dealing with boys who went from being just pesky to being pesky and yet strangely more appealing. I have vivid memories of feeling the heat rise to my cheeks as the main character in her desperation chanted, “I must, I must, I must increase my bust”. Mostly I was just flabbergasted because I was one of those odd ducks who really didn’t want to develop and frankly abhorred the idea of growing up in general and the thought of purposely trying to ‘increase your bust’ seemed beyond my comprehension. I also remember the day when my mom and I sat on the couch in our family room and she read out loud to me the book ‘Fearfully and Wonderfully Made’. This was ‘The Talk’ moment and I was more than relieved when it was over and I could go back to playing Barbies. Now, even though I pouted when my mom insisted I start wearing a training bra (I vividly remember sitting out on the curb in front of my house and thinking that this radical change must be so obvious that the people in every single car that drove by just knew that I was wearing a bra!) and even though I couldn’t wait to get off that couch when ‘The Talk’ was over, it by no means meant that I hadn’t absorbed all of this new, shocking information. But, no where, not in any single book or Teen Beat Magazine or 6th grade health class did they ever mention chin hairs. Really, someone should have warned me. Chin hairs are not ‘fearfully and wonderfully made’. As if it isn’t bad enough that I’m nearing 40 and still have the occasional pimple (yet another thing that I should have been warned about), I regularly find myself horrified when the light hits my face just at the perfect angle to reveal a coarse, black nubbin of a hair (or two!!) sticking straight out. Usually this happens at a time when I cannot locate a pair of tweezers which frankly I’ve come to realize should be with me at all times. Like people who have to have an epipen with them in case of an allergic reaction. I’m quite certain that throughout the course of history as the Bible was translated, they left out one very important verse. When God is handing down the consequence of their sin to Adam and Eve and He informs them that they will now have to toil the earth for food and have pain in childbirth they forgot to include ‘Thou shalt be cursed with chin hairs’. The other morning as I once again reached for my trusty tweezers, I realized that one particularly annoying chin hair always grew back in the same exact spot. It was relentless. I plucked, it came back. And sometimes it would even bring a friend or two. And as I contorted my arms into all sorts of interesting positions trying to get just the right angle to pull that sucker out, I realized how much that chin hair was like sin. No matter how many times the light is shined on the sin in my life and I recognize it, ‘pluck’ it out, put some makeup on it and go about my day, it seems to come back again and again. Usually in the same place. I like to think of myself as a ‘quick study’, someone who catches on to things pretty easily. And yet, I find that over and over again, like a stubborn chin hair, there are sin areas in my life that I think are resolved and yet continue to resurface. Through recognition of my sin, confession and the receiving of forgiveness I’m made new and whole. The slate has been wiped clean. But, even though the slate has been wiped clean, it doesn’t mean that it won’t get written on again. It’s in our nature as humans after all. I’m so, so grateful for the grace that is extended to me over and over again. And yet, while that grace and forgiveness is given to me unconditionally, it doesn’t excuse me. We often get caught up in this idea of nothing being required of us when it comes to our relationship with the Lord. But I think that can become a crutch. Hear me when I say this, there is a point at which I must get up from kneeling before the throne and start walking again. And I must walk as one who has been made new. The definition of insanity is essentially doing the same thing over and over again expecting different results. We sin, come before God, confess our sins, receive forgiveness and then go on to do the exact same thing again. Yet we know that we cannot change through our own power. So, what’s the answer? But, what I am sure of is that in order to be truly ‘made new’ I must be willing to allow God to be the Master ‘Plucker’. You see, if I really wanted to do away with those chin hairs forever I realize that I could just do laser removal. Zap those bad boys! But, my guess is that once I zapped one area, another one would pop right back up. Like in the form of long nose hairs or something. And that’s the way sin is. We might conquer one area of sin in our lives, only to realize that another has surfaced. Why not just let those hairs grow willy-nilly? Well, for one thing, I’d probably end up in the circus or at the state fair where people would win prizes trying to guess the length of my chin hair. And, for another, frankly I’m supposed to continue to grow in my faith. I don’t want milk anymore. I want solid food! I want God to take out those tweezers and pluck away! Will it sting? Yes. Will some of those ‘sin hairs’ (like how I did that there?) try to come back? Yes. But, if I’m truly being ‘transformed’ then they should pop up less and less. 25 Comments on "The Chin Hair"
Boy, aint it the truth! Thank you for your witt and charm. Those ugly hairs do keep showing back up when least expected. I am so grateful for communities of God’s Girls who share their true selves so we can hold each other up. It’s a challenge and a battle at times but thank God we know who wins in the end!!! Well here I thought you’d give me a solid solution to sin an d chin hairs — wait until you get them around your mouth like a mustache!! Yep I think people must think I’m always deep in thought — you know rubbing your chin, Uh Uh!! I’m making sure there isn’t a little stubborn stiff hair sticking out where it doesn’t belong. I know what to do about sin — haven’t found the solid solution to chin hair. Anyone try the No-No?? I hate to fork out that much cash if it won’t work. I so related to this post, you are spot on! I’ve tried to refer to those chin hairs as my misguided super power….the ability to grow eye brows on my chin. I will think about this every time I pluck them out, which is way more often than I would like to admit. This is a keeper! Thank you for your wit and spiritual insight. 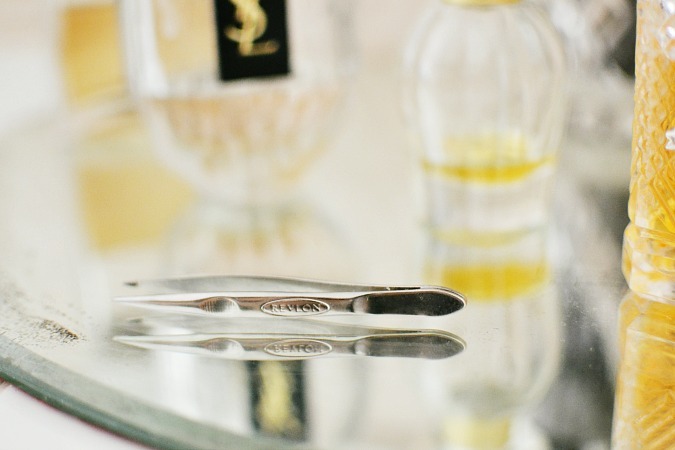 Life as a believer is a daily recommitment…..just like using those silver tweezers each morning. I am still laughing but love the lesson behind it. God bless you for being a great teacher. Chin hairs are the bane of my existence right now! How is it that you can go to bed, chin hair free, and wake up with one that looks like it should be coming out of a witch’s wart?!? I hear you! Great post! What a wonderful post! My Mother had chin hairs so they’ll probably crop up on me; already dealing with a MUSTACHE that also only appears in the rear view mirror while I’m driving. My coping with that mustache is to periodically shave it…way too many fine hairs to tweeze. Just be sure to add moisturizer after that quick little shave. Hahaha – I have one stubborn little guy that keeps coming back in the same spot and this made me laugh out loud. Tweezers in the car? Check. oh just wait….my chin and now lip hairs are starting to turn gray…..lovely…I think NOT….same with my vanishing eyebrows…fewer and fewer…and now turning gray….haven’t plucked those babies in years….me and the eyebrow pencil are fast friends…and still get pimples….almost 60 years old….aging isn’t for the faint of heart!!! I share your pain sister! Oh my gosh! I just loved this post and I will have to look for those Tweezerman slanted tip tweezers that someone suggested. Have you ever had one of those hairs to grow inward and cause the biggest pimple that you’ve ever had in your life? Just like sin, it festers and hurts until all is forgiven. I think I caused it because I was subconsiously pushing on the hair. Won’t do that again! Love this article! I will never think of chin hairs the same again and it’s nice to be able to blame someone so I’ll blame Eve. Thanks for the insight. Vanessa-Glad I’m not the only one struggling with chin hair-and sin, Thankful for your honest,sweet and funny blog. Thankful for God’s patience and forgiveness. And for thankful for my tweezers! I have already told my daughter that when I get old and feeble to please pluck the black hairs off my face for me. She’s been given clear instructions!! “Thou shalt be cursed with chin hairs.” I almost spit out my coffee :D. Such a great post! Thank goodness for tweezers, lighted magnification mirrors and God’s grace! !